Lorena Villanueva and Emy Pagaduan. Credit: Yonna Waltersson, Arbetet-Global/IPS. MANILA, Dec 4 2018 (IPS) - Rodrigo Duterte’s bloody war on drugs has claimed tens of thousand of lives. Lorena Villanueva and Emy Pagaduan lost their sons. Now they are demanding that the President of the Philippines be held responsible for the killings. A basketball bounces. The heat feels almost physical against the skin. Young men dribble the ball playfully on the hot afternoon of Christmas Day. A mother approaches them asking to borrow a few pesos to buy water. A son grins back at her. For a short time, it’s only a moment among others. A few hours later, it has become a memory carefully imprinted on the mind of a mother , the memory of the last time she saw her son smile. That evening, he is murdered – shot to death alongside a friend. Two of the thousands of people killed in Philippine President Rodrigo Duterte’s bloody war on drugs. ”They ride in tandem,” says Lorena Villanueva. “One steers the motorbike, one shoots,” says Emy Pagaduan. 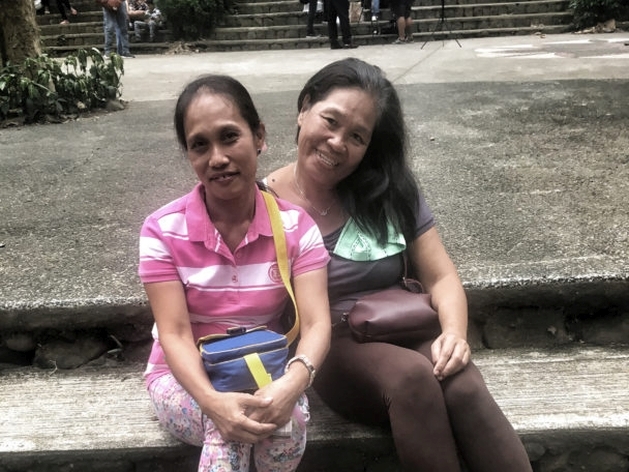 It’s their sons’ killers that the two women are talking about as they sit in a park in the middle of Manila. Those who appeared on Christmas Day 2016 and who shot their sons to death. 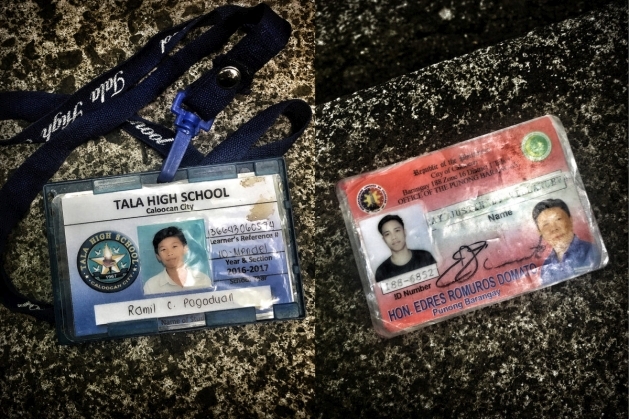 21-year-old Ray Justin Villanueva and 16-year-old Ramil Pagaduan were killed early in the war on drugs that is still underway. By now, ”ridning tandem” has become the mental image of how the killings take place. Motorcyclists quickly drive into an area and shoot the person next in line to be killed. ”We thought it was fireworks that we heard, which is not surprising given we were in the middle of Christmas celebrations when we often have fireworks,” says Lorena Villanueva, when the Arbetet Global meets her during a journalist trip organized by the Olof Palme International Center. Ramil Pagaduan and Ray Justin Villanueva. Credit: Yonna Waltersson, Arbetet-Global/IPS. In Calookan, Manila, where the two women live, a handful of people die every day in the war on drugs. The area is poor, which has been a common denominator of murder locations. The political opposition suggests that’s because the country’s poor people have a harder time pursuing legal action and the police can therefore kill with impunity. But trade union activists, human rights lawyers and politicians are also among those killed and imprisoned, and a climate of fear has established itself in the community. The war on drugs began immediately after Duterte was sworn in as president in June 2016. During the presidential campaign, he promised that 100,000 criminals would be killed. Labour Market: Agriculture and forestry employ one third of the labour force. Several million women from the Philippines are migrant workers and work abroad as housewives or in healthcare. The strong party-political union movement is very divided. The laws hamper union organisation. In order to be entitled to negotiate on behalf of employees, a trade union must be supported by a majority of the employees in the workplace. Every five years, new local union elections are organised and rival organisations try to survive in the workplace in the hope they can win the next election. Other: The country consists of 7 000 islands and has been independent since 1946 but has experienced difficulties around establishing a democracy. In the north, there is a communist revolt, while the south is marked by a Muslim separatist war. Official figures now state that about 5,000 have been killed in the war against drugs. Local human rights organisations insist it’s more than 29,000 people. The official stance is also that those who have died in the war on drugs have done so because they were violent during their attempted arrests. After the death of her son, Lorena Villanueva has left her job. She says she has to devote herself to protecting the children who are still alive. It’s usually young people that are killed. Sitting on the stairs in the park, she pulls a photo of her son out of her handbag. “He was always so happy. After my husband’s death, he had taken on his father’s role. He always had so many plans for what he wanted to do and things to fix in the house,” she says. That’s how the police compile a list of those to be killed so that they can meet their quotas, she says. An Amnesty International report on the war on drugs, released earlier this year, contained testimonies that a bounty is paid for each killing. Depending on who is shot, the killer is said to be able to get between 8,000 and 15,000 pesos. Akbayan’s Machris Cabreros says the system creates a culture of informers and establishes a fear in society. Among those who have experienced the war on drugs, there is also a sense that it is the poor that are being killed. ”Those involved in the drug trade are safe. It’s us poor who lose our lives,” says Lorena Villanueva. Lorena Villanueva and Emy Pagaduan are part of a larger group of women who have filed charges against the president in the International Criminal Court in The Hague (ICC). A preliminary investigation has begun. With the application to ICC, the group hopes to hold someone accountable for the lives lost. ”We want justice,” says Emy Pagaduan. The fact that President Duterte has acknowledged that extrajudicial killings take place in the country can lend weight to the ongoing investigation. But few – if any – people believe the investigation will result in a drop in murder rates. ”There is no indication that it is about to slow down, even though he is aware that there is an investigation. Maybe if he is forced to go to The Hague for questioning. But the investigation will take time and Duterte has also threatened that the Philippines will leave the ICC,” says Kith Melgar, one of the Akbayan party leaders. Another Christmas is around the corner; a much-loved celebration for many Filipinos, who start celebrating as early as September and continues until Christmas. But Emy Pagaduan says her family no longer join in the festivities.